To find the best iPhone data recovery software, we tested five most popular tools and evaluated them carefully to provide valuable references for you. If you’ve lost or mistakenly deleted photos, messages, notes and other essential things on your iPhone, read on to choose the best helper to retrieve your lost iPhone data. By nature, an iPhone is always in danger of getting damaged, lost or stolen. How would you evaluate the cost of losing an iPhone? The answer may vary based on your usage, but it’s a common view that the photos, messages, contacts, music and other personal data on iPhone are more valuable than the device itself. Through our tests and research, the best 5 iPhone Data Recovery software we found in 2018 are PhoneRescue for iOS, Dr. Fone for iOS, Enigma Recovery, Primo iData Recovery, and iSkysoft. The purpose of this review is to cover as many best iPhone recovery software. as possible, define the criterions of what are the critical factors based on our experience, test performance of each candidate, then finally, to help you get the best chance to recover your important iPhone data. iPhone data recovery is a process of salvaging inaccessible data from corrupted, damaged or lost iPhone device. Commonly used methods include recovering from iPhone device, from iTunes backup or iCloud backup. Recovery can still process even the iPhone device is lost, as long as the iTunes / iCloud backup has been taking place before the inaccessibility of the device. There are many specific categories of data recovery software such as iPhone photo recovery software, iPhone messages recovery software, iPhone contacts recovery software, etc. Well, this software can be called by a joint name – iPhone data recovery. Our principles of defining what the best iPhone data recovery software is are as the same as how you’d like to recover your lost iPhone data. Before starting, you’d better clearly understand WHERE have you forgotten the data from? HOW did you miss the data? WHAT types of iOS data would you like to recover? For the first question: WHERE have you lost your iOS data, from an iPhone 4s, iPhone 5, an iPhone SE or iPhone 6? As Apple mobile product line covers over 10+ iPhone models, the first criterion we chose is the compatibility. iPhone recovery software should be capable of supporting all existing mobile device models, iOS versions and even the upcoming new Apple devices. For the second question: HOW did you lose your iOS data, mistaken deletion? The device is lost or severely damaged? iOS gets stuck? Studies show hardware/software failure and human error are two most common causes of iOS data loss, but different type iPhone data disaster requires corresponding iPhone data recovery methods. Three most adopted iPhone Data Recovery approaches include recovering lost data from the device, from iTunes backup, and iCloud backup. There are also other tips that may help find your lost data; some even don’t need special tools. For instance, if you’ve deleted pictures in your Camera Roll, you can retrieve your photos from the Recently Deleted album. Other similar self-helping iPhone data recovery tips are like finding your lost pictures from Photos app on your Windows / Mac desktop; getting data back with the help of iTunes Backup Extractor, to name a few. iPhone Data Recovery software also follows industry rules: no matter how hard you’ve tried to recover your lost iPhone data, you still have a chance that you’ll lose them forever. So the third question, WHAT types of iOS data would you like to recover? This is the most basic standard to justify if your iPhone data recovery tool is qualified. All candidates listed below support a wild range of data recovery file types. By uplifting both technical and user experience to a new industry standard, PhoneRescuehas been upgraded to version 3. PhoneRescue aims at helping more and more users get back lost data quickly and easily from both Android and iOS devices. Two great improvements make PhoneRescue for iOS the top 1 iPhone Data Recovery choice on our list: the leading iOS data recovery capability and the easy user experience. Helps find back up to 25 types of deleted, damaged or lost iPhone, iPad data, covering messages, photos, notes, contacts, Safari bookmarks, music, What’s app message attachments, Line Messages as well as your other frequently used iOS content. Features one of the most desired abilities to import retrieved iOS data directly back to the iPhone apps, such as contacts, messages, photos, notes, etc. Introduces the exclusive iPhone Data Recovery feature – Smart Compare and Find, which allows to pinpoint needed items from thousands of ones quickly. PhoneRescue for iOS expanded the recovering power from specific data to the full iOS. When an iOS device runs into a system crash, it can fix within a single click. The iPhone data recovery capability has been improved both in efficiency and success rate. The recovery rate of mistaken deletion achieves 76%, and the data analysis time is shorten to 65%. The new PhoneRescue for iOS design fully meets the beginner’s need to suggest scenarios about different recovery methods for a more successful result. Dr.Fone for iOS is another acclaimed iPhone Data Recovery tool developed by WonderShare. It is excellent for recovering deleted content from both iOS and Android mobile phones. It goes to work immediately, when there is a problem: connect an iPhone to the computer, open Dr.Fone, and with a few clicks users can scan their mobile phone and instantly see what information is recoverable and then restore it. For iPhones, where data cannot be recovered directly from the device, Dr.Fone can also retrieve information from the latest iTunes backup file. When disaster strikes, Dr.Fone is a user’s best chance to get their data back. It supports all old and latest iOS devices. Fitted with a small tool that can fix iOS to normal when your iDevice can’t get access to the operating system. Supports recovering Facebook Messenger and Messenger attachments. Not free, and it is a little expensive. Most functions are locked until the upgrade to the Pro version. Doesn’t support recover music, videos, and other media files. If you have accidentally lost or deleted important data from your iOS device, the Enigma Recovery software is also an ideal solution for you. With SmartPhone Recovery Pro software and Restore iOS App brought by Enigma Recovery, you can preview existing data on your iOS device, iTunes or iCloud backup. Are you thinking is enigma recovery safe? This is quite useful if you have lost your device and need access to the data on your backup file. Clear UI design and friendly user experience. Supports Windows XP, Vista, 7, 8 & 10 (32bit & 64bit) | Mac OS X 10.7 & higher. Restore deleted messages, contacts, calls, notes and calendar to iPhone. Import restored data to device require another iOS app. The device data scanning speed is relatively slow. The range of supported data types is relatively limited. Primo iPhone Data Recovery is made to orchestrate your data disaster recovery plan with a super easy process. This newly released iPhone data recovery tool gives excellent support in recovering up to 25 types of iOS content: SMS/iMessages, Notes, Contacts, Call History, Photos, Reminders, etc. It also provides three recover modes, so no matter you have a backup or not you can get back deleted iOS data as you need. The iPhone data recovery workflow is more natural than other candidates. Selectively Recovery – Instead of performing full recovery on all lost files, you can selectively recover the needed ones. Not free, it charges $39.99 for Personal License. 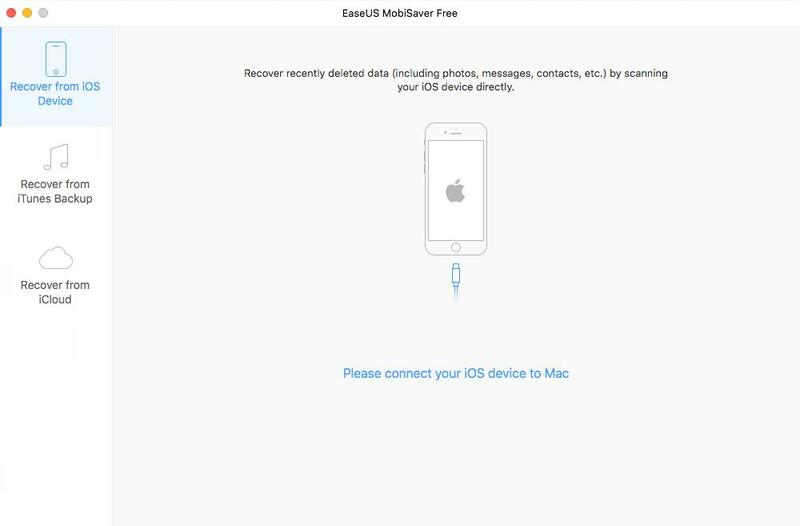 EaseUS MobiSaver would be a good application if data loss issues happened with your iPhone, enabling you to retrieve information only from your backup file. You can choose any information you want to take back: photos, songs, contacts, messages, reminders and notes, and so on. But it might not be perfect as various problems you might encounter along the way. One problem is that even the computer OS recognizes the gadget, the free program refused to see it. The problem persisted for several minutes at our test, without performing any setting changes. In a word, the MobiSaver EaseUS is a program full of good intentions, simple to use, but it demands great patience from the user, as sometimes it is slow to react. As the frequency of iPhone data loss is increasing, it’s suggested to consider taking proper precautions to decrease the cost and impact of data loss. A regular iPhone / iPad / iPod backup plan with iTunes and iCloud is always welcome. Meanwhile, to increase your chances of recovering the data you need, you’d better stop using your device until your lost data get retrieved, as this will lower the chance of overwriting data on iPhone disk. Anyway, if ‘disaster’ happens, have a try with the iPhone data recovery solutions mentioned above to get back your lost data. Next articleWhat is VulkanRT? Why It is Required? What Happens If Removed? Recently my nephew has deleted all the contacts on my iPhone 7, what’s worse, I haven’t gotten time to back up my iPhone. My best friend recommends iPhone Data Recovery for Mac launched by TunesKit to me, claiming that it is the best iPhone data recovery software that he had ever used. I was skeptical at first but still try downloading the program and follow the tutorial guide to finish the whole recovery progress. To my surprise, it did get all those deleted contacts back instantly even without backup. It is really an excellent experience and I have shared this recovery tool to my other friends.